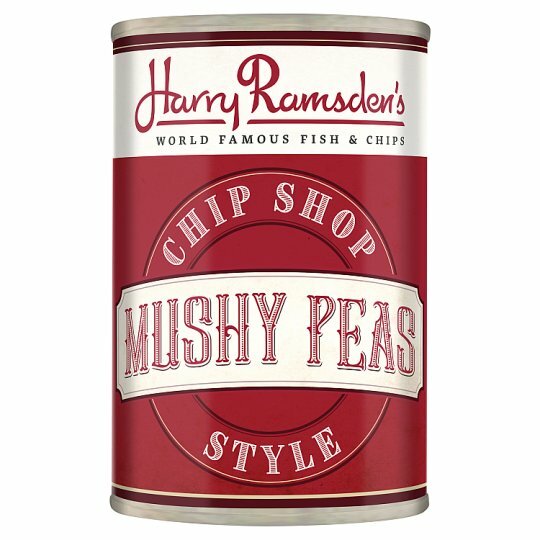 At Harry Ramsden's we've known since 1928 what it takes to make perfect fish & chips. Our mushy peas are lovingly created to bring you the perfect accompaniment! Store in a cool dry place. Once opened empty, cover and refrigerate. Use within 2 days., Best Before End: See can end. Hob (From Ambient): Empty contents into a saucepan and heat gently. Do not boil. Microwave (From Ambient): (750W): Empty contents into a microwaveable container, cover and vent. Heat on full power for 2 1/2 minutes, stirring halfway through. Allow to stand for 1 minute before serving.